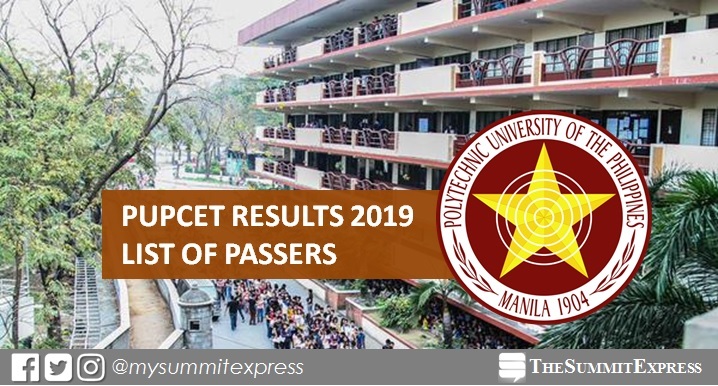 MANILA, Philippines – The Polytechnic University of the Philippines (PUP) College Entrance Test (PUPCET) results for AY 2019-2020 are released online on Friday, March 22, 2019. The complete list of passers and waitlisters are available on this page as announced online. PUPCET 2019. The Polytechnic University of the Philippines (PUP) will soon name the list of new Iskolar ng Bayan. PUP named those who hurdled the Batch 1-5 entrance examinations at PUP Main Sta. Mesa, Manila. PUP announced Monday (March 18) the list of programs and schedule of online posting of results and confirmation for School Year 2019 - 2020. PUPCET was administered on October 20, 2018 (first batch), January 12 and 13, 2019 (second and third batch). The fourth and fifth batches are set on February 23 and 24, 2019. Aside from Sta. Mesa, PUPCET is also set in all campuses nationwide. The link to view the PUPCET passers who are qualified for admission in the selected PUP branch or campus shall be available soon. Note that each campus has an allotted specific date to show the list of its successful examinees. Confirmation of slot and schedule of application are done through the university's website (https://www.pup.edu.ph/iapply/pupcet), and failure to confirm slot may result in the cancellation of admission to the campus. Monitor this page more often to check relevant updates on PUPCET 2019 results. You may also visit the official website of PUP for other information.